Knowing how home loans work is the surest way to avoid tiffs with lenders. "I took a floating rate home loan from XYZ Bank at 10.5% three years ago. Subsequently, as the Reserve Bank of India, or RBI, increased rates, my bank also raised the interest rate. At present, it is charging 13.5%, but is offering new customers much lower rates of 10.25-10.50%. On what basis is it charging more from me? I want, with interest, all the extra money it has charged from me." This is what a borrower has written on a consumer complaint forum. In another such post on the website, a borrower has expressed shock that despite paying Rs 19,800 every month for two years (on a loan of Rs 20,39,400), his outstanding is still a high Rs 20,20,000. Such outbursts by people who have taken home loans are common on consumer redressal forums. Though many complaints are genuine and about poor service, rude employee behaviour, etc, many (like these examples) result from a lack of awareness about the home loan business. If you have taken a home loan or plan to take one, you can avoid a lot of hassles and bitter exchanges with lenders if you know some basic facts about home loans. Why do banks charge existing customers more than their rate for new customers? Is it a way to 'fleece' customers who they think are stuck with them? Loans by banks are linked to their base rates (below which they cannot lend). The loan rate is usually base rate plus a margin, for example, base rate plus 50 basis points or bps. Banks arrive at the base rate after looking at their cost of funds and other factors. That is why it is different for each bank. "As banks review their base rates at least once a quarter, floating rates may go up (or down) based on the call taken by each bank," says Brijesh Parnami, CEO, distribution, Destimoney Enterprises, which provides mortgage-related advice to retail customers. The base rate may change but the bank cannot alter the spread or the margin at which it has offered loans to existing customers. So, if the base rate comes down from 10% to 9.75%, the interest rate for existing customers will fall from 10.5% to 10.25% (considering a spread of 50 bps). However, banks can offer new loans at a higher or lower margin, say, base rate plus 25 bps. So, for a new customer, the rate will be 10% (base rate at 9.75%), while old customers will continue to pay 10.25%. Existing borrowers feel 'cheated' by such a difference in rates. "It (differential rates) may happen with a few lenders, but is not a general practice. Actually, it depends upon the pricing methodology followed by individual lenders," says V.K Sharma, managing director and CEO, LIC Housing Finance. The difference in rates were higher when banks used to benchmark home loan rates to Prime Lending Rates or PLR. "Ever since banks have shifted to base rates, the difference has come down sharply than what it used to be when home loan rates were benchmarked to banks' PLRs," says Vishal Dhawan, founder and chief financial planner, Planahead Wealth Advisors. PLR is the rate banks used to offer to their most creditworthy customers. However, the system was imperfect, with banks subsiding corporate customers by charging more from retail borrowers. That is why the RBI introduced the base rate system in July 2010. There are two ways to deal with the problem of differential rates. One, you can switch the loan to a bank offering a lower rate. This is easy now as pre-payment penalty on floating rate loans has been abolished. The new bank will charge only a processing fee of 0.5-1% of the outstanding loan. Some banks may even waive the fee if you bargain hard. Another option is switching to the lower rate being offered to new customers by paying a small fee. Most banks offer this facility to retain customers. "Banks do not publicise this facility and offer it to customers only on demand or when they show willingness to shift to another bank. That is why many customers are not aware about this," says Bakshi of BankBazaar.com. Not all lenders allow switching to a lower rate. Some instead reduce the tenure of the loan. Is this another ploy by banks to keep you paying for a longer period? No, it is not. No matter how high or low your EMI (equated monthly instalment) is, its interest component will be very high in the initial years. Let us consider that you have taken a loan of Rs 30 lakh for 20 years at an interest rate of 10%. Your EMI will be Rs 28,950. After two years, the outstanding will be Rs 28.95 lakh. For Rs 6.95 lakh that you have paid in these two years, the principal will fall by only Rs 1.05 lakh. In the first five years, only 17.6% EMI will go towards paying the principal. In the first 10 and 15 years, only 23% and 31.5% EMIs, respectively, will go towards payment of the principal. The higher the rate of interest or loan tenure, the slower is the reduction in principal in the first few years of the loan. The timing of loan prepayment could be based on this calculation. Since in the initial years the interest component is high, it makes sense to prepay during this period. Staying with the above example, if you prepay Rs 5 lakh after five years, you will save Rs 4,67,339 in interest. If you make the same payment after 10 years, you will save only Rs 2,92,904. After 15 years, the saving will be just Rs 1,37,411. "It is best to prepay in the initial years, but the decision should be based on your net savings after considering that you save tax on interest payments (up to Rs 1.5 lakh in a year)," says Vishal Dhawan, founder and chief financial planner, Planahead Wealth Advisors. Interest payment up to Rs 1.5 lakh is deductible from salary for tax calculation. Another Rs 1 lakh deduction is available this year for first-time home buyers taking a loan of up to Rs 25 lakh. How often have you seen a headline like this - "EMIs to come down as RBI cuts rate"? Every time the RBI cuts interest rates, you are made to believe that your EMI will come down. But this is not always the case. Lenders prefer to shorten the tenure than change the EMI. The reason is convenience. This saves them the hassles of readjusting the EMI, changing the ECS mandate and accepting new post-dated cheques. ECS, or electronic clearance service, is a facility for electronic transfer of money. Adhil Shetty, founder and CEO of BankBazaar.com, says, "For most borrowers, EMIs remain the same for the entire loan tenure, and it is the principal-interest ratio that keeps changing." "When rates fall, reducing the tenure is beneficial for the borrower, as the interest cost falls. However, when rates rise, a longer tenure means you pay more interest," says Dhawan of Planahead Wealth. Let us assume that after three years the rate is revised from 10% to 9.5%. If the EMI remains the same (Rs 28,950), the tenure of the loan will come down by 15 months. You pay Rs 26,45,109 in interest for the rest of the tenure (189 months). However, if the EMI is re-adjusted and the tenure remains the same, you pay Rs 28,89,231 in interest during the rest of the tenure. This is Rs 2,44,121 more than the interest paid during the shortened tenure. 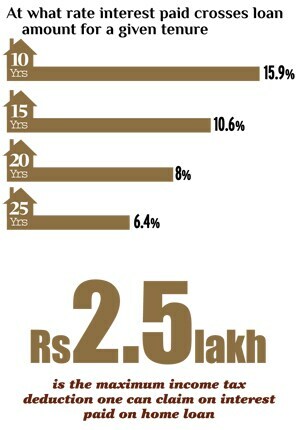 At 8%, you pay Rs 30.22 lakh interest on a loan of Rs 30 lakh if the loan tenure is 20 years. 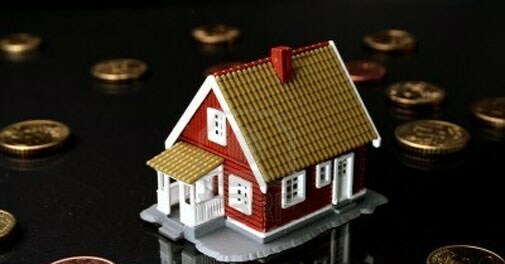 Many borrowers do not realise that a house bought on a loan will cost them more than double the price tag. The longer the tenure, the higher will be the interest payments and higher will be the chance that you will pay more interest than the principal. The minimum average rate at which the interest is more than the principal is 8% for a loan whose tenure is 20 years. If the tenure is 15 years, the minimum average rate has to be 10.6% for the interest to be more than the principal. For 10 years, 15.9% is the minimum rate at which the interest will be more than the principal. If you are opting for a fixed rate, look at the fine print. It's rare for a fixed rate home loan not to have a reset clause saying that the rate is subject to revision. The clause varies from bank to bank and is invoked either after a fixed period or a sharp spike in interest rates. A reset clause ensures decent cash flow for banks if there is any sharp rise in their cost of funds, says Shetty of BankBazaar.com. "Generally, a fixed rate loan should not have a reset clause and the interest rate should remain fixed throughout the tenure. However, some lenders do have a clause to reset even the fixed rates in case of any extreme rise in interest rates in the system. It should be noted that the lender is also a borrower who has contracted his borrowings on certain terms and conditions," says V K Sharma of LIC Housing Finance.